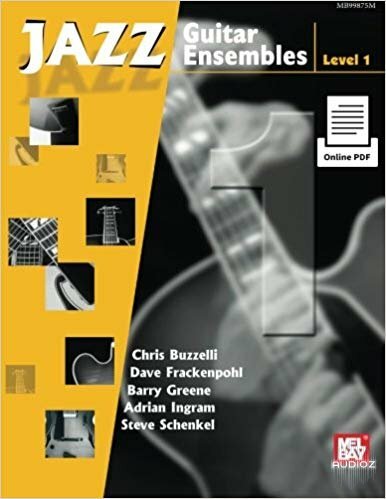 These beginning to advanced jazz guitar ensembles are written for four and five guitars by some of the best guitar ensemble arrangers in the business. Arrangers include, Barry Greene, Dave Frackenpohl, Steve Schenkel, Andrian Ingram, and Chris Buzzelli. Not only are these fine performance pieces for ensembles, they are good material for sight-reading. These graded volumes follow Mel Bay's guitar grading system. Each chart in all three levels offers students the opportunity to improvise with rhythm guitar and, in some cases, background figures. Level I presents simple rhythms, is technically easy and all of the parts are primarily played in first position. These are perfect for beginning guitar classes and students who are starting to read standard notation. Each volume contains five pieces for the price of what one ensemble piece usually costs. The score and all guitar parts are included in the book. In addition, the score, 2nd, 3rd, 4th and 5th guitar parts can be downloaded. download from more than 100 file hosters at once with LinkSnappy.